It’s easy to tell who has had a Google profile before Google+. Just take a look at their pixelated profile pic. Google+ = bigger profile pic. Above are my before and after pictures. 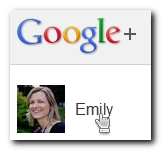 Have you updated your Google+ profile picture yet? Here’s how. While you’re signed into Google+, click on your name in the upper left corner. Next, click on your name next to your picture in the upper right corner. Now Click on Edit Profile (upper right section of page). Notice that there’s an X in the top right corner of your profile photo (click to delete) and a link to Change Photo underneath your photo? Click on the link and from here you can select a new photo. 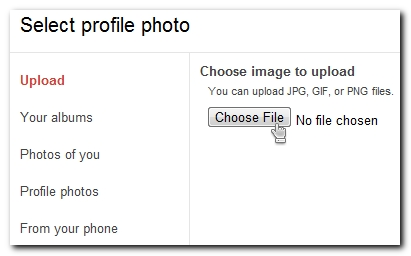 You have the choice of uploading a photo, or choosing an existing photo from photos you already have uploaded to Google. Select your picture, and you’re done! WhizBang! Notice that your profile photo shows up as a square? Use photo editing software to crop it before you upload it to have square dimensions. Just be sure it’s at least 200 x 200 px (the final dimensions Google uses). Try Google-owned Picnik for free, fast photo editing. Add a link to your Google+ profile in the comments so we can check out the results!